A man from North Tonawanda, New York, is facing charges after an unusual incident at the Mid-City Plaza on Wednesday afternoon. A woman was in Dollar Store with her child and a neighbour's child when police say 67-year-old Herbert Forrester began following them around the store. 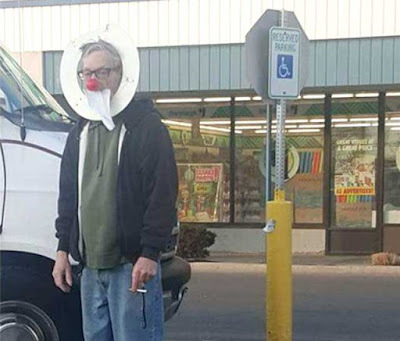 The woman says he was following her and the children around while wearing a clown's nose. When the woman and children left, police say he followed them out, ran to his van and put a toilet seat around his head and toilet paper in his mouth. Police say the woman ran to her car with the children as Forrester allegedly yelled, "Yeah, run!" Once safely inside, the woman says she snapped a picture of the man for evidence and then called police. Police later caught up to Forrester and arrested him, charging him with harassment. "He says he has a strange sense of humour and knows he has to stop doing those things," North Tonawanda Police Capt. Thomas Krantz said. "This has happened before." Krantz added that while this is Forrester's first arrest, he has had encounters with police in the past after making others "uncomfortable." Krantz said police have no indication that Forrester is prone to violent behaviour. However, he said that the public should be aware of him, citing his "strange" actions and previous incidents. "It's hard to put into words with any certainty as to what his motives were or what future incidents could occur," Krantz said. "We just don't know." Forrester is currently free on $100 bail.